Hilton HHonors Three Combinable Conrad & Waldorf Astoria Promotions Still Posting! Hilton HHonors launched three separate promotions for stays at Conrad and Waldorf Astoria brands back in 2014 and 2015. These promotions were supposed to end on December 31, 2016, but they are still alive. I wrote about this in early January after one reader had some of the bonuses to post to the stay in 2016 (read more here) and I then had one stay at the Conrad too (read more here) where the points posted just fine. You can access these three promotion on Hilton’s website here, here and here. So, this proves that the bonus promotion for up to 10,000 points posts too. It is 2,000 bonus for the first stay, 3,000 for the second and 5,000 for the third one for a total of 10,000 bonus points. For every stay that is two nights or more at Conrad & Waldorf-Astoria hotels, you earn 5,000 bonus Hilton HHonors points. The number of Hilton HHonors bonus points that you can earn for this Conrad & Waldorf-Astoria promotion is maxed at 10,000. You earn 2,000 bonus for the first stay, 3,000 bonus points for the second stay and 5,000 bonus points for the third stay. If you completed this offer in 2014, you won’t earn bonus points in 2015. This Hilton HHonors Conrad & Waldorf-Astoria promotion is for 2,000 bonus points for each night at these two brands until the end of 2015. 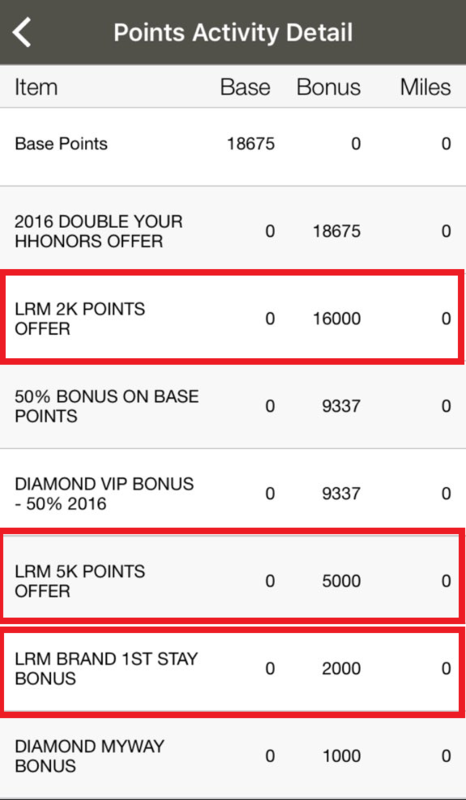 It is weird that Hilton HHonors has not officially extended these promotions but the bonus points continue to post. These should also post for award stays (they have in the past). This could be a promo programming error from Hilton’s part or these really have been extended but they haven’t just extended the expiry date.